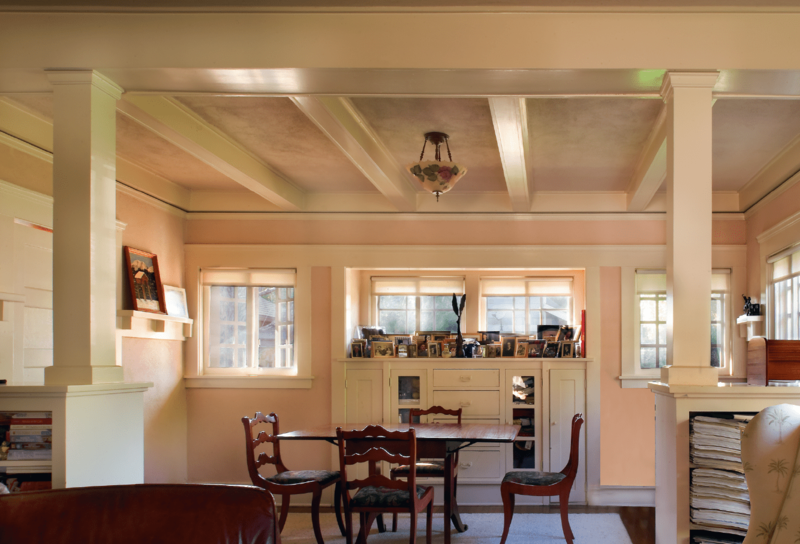 Scores of bungalow courts were built in central Pasadena between 1910 and 1930—predominantly in the Craftsman style until around 1915 and later in revival styles including American Colonial, Spanish Colonial, Tudor, Mission Revival and Art Deco. In 1982, Terry Tornek, Pasadena’s then new city planning director, was a newcomer from Springfield, Mass., where he had developed a reputation in neighborhood improvement and historic preservation. He says he found the city’s early-20th-century bungalow courts “a revelation” when one of the first projects he undertook was a joint effort with Pasadena Heritage, the private nonprofit historic-preservation organization, to save the 1910 Gartz Court from demolition. 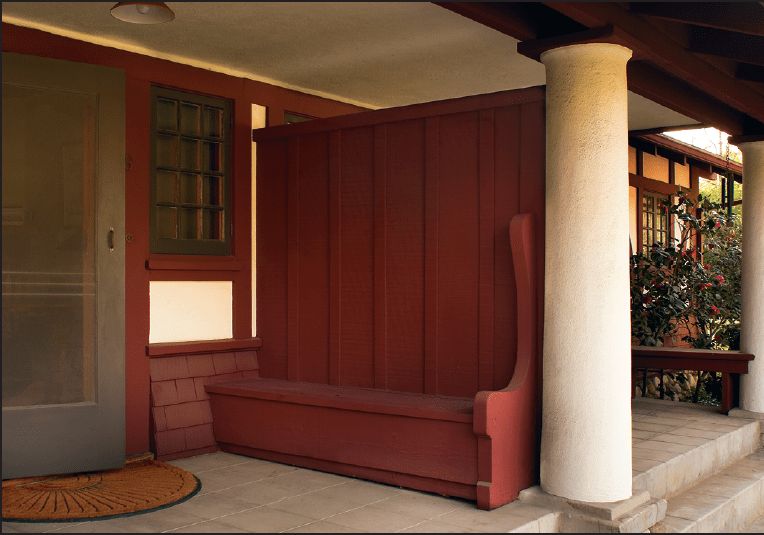 Each of the duplex units has a built-in bench on the porch. Pasadena Heritage was still a relative newcomer on the preservation scene itself, having been founded in 1978. By 1982, however, led by co-founder and executive director Claire Bogaard, it had spearheaded a successful broad-based community effort to persuade the city to designate virtually all of its derelict original commercial downtown as a historic district and set guidelines for restoring the historic buildings. That achievement, during which Tornek says Pasadena Heritage “did the heavy lifting” of selling the merits of historic preservation to local property owners and developers, paved the way for one of the most successful downtown revitalizations in the country: the rise of Old Town Pasadena in the late 1980s and 1990s. The downtown preservation campaign had also strengthened the working relationship between the preservation organization and the planning department’s Urban Conservation program. So in June also design landscaping and garages that would make the project among the first in California to be conceived as a group of small but full-fledged owner-occupied homes. As it turned out, after the team received early word that its proposal had survived a preliminary screening, they were disappointed to learn that it had not made the final cut. But, as Claire Bogaard recently recalled, Tornek, her counterpart at the city, said to her, “This is a good project. Let’s just do it.” And they did, with two Southern California corporate foundations contributing the matching funds that would have come through the state grant. 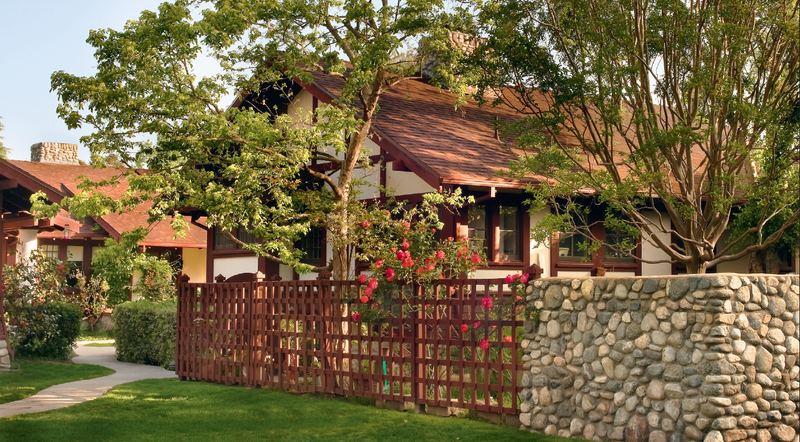 Restored at the time of the 1984 move, the small, sunny bungalows remain in near-vintage condition today. “I have always said that Gartz Court is my favorite project from the years I worked at Pasadena Heritage,” Bogaard said recently, in recalling the project’s history. Linda Dishman, who as a senior planner with the city’s Urban Conservation program was the staff representative assigned to the project, and who went on to become executive director of the Los Angeles Conservancy in 1992, agreed: “It was the best partnership I’ve ever been part of.” This fall, on Saturday, October 16, as part of a Bungalow Courts bus tour that is planned for its annual Craftsman Weekend, Pasadena Heritage will hold an 11 a.m. celebration of the 100th anniversary of the court, which will be open to visitors throughout the weekend. Bogaard, along with others who were instrumental in the preservation effort, will be present at the event. 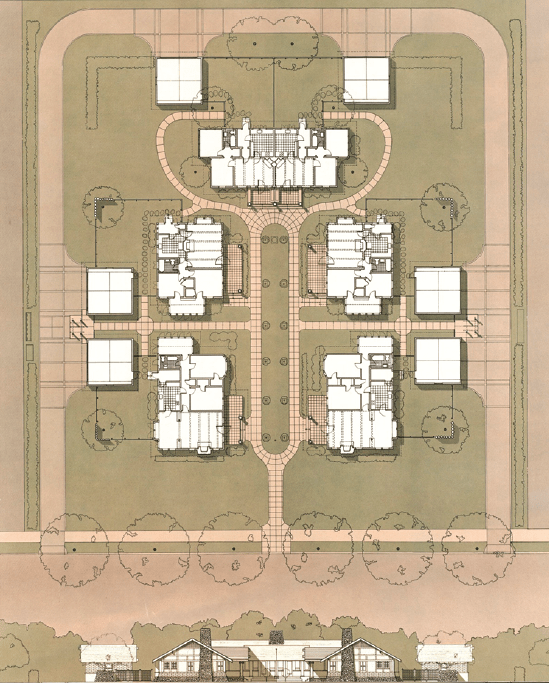 Today, Bogaard, Dishman and Sue Mossman, Bogaard’s successor at Pasadena Heritage, agree that communicating with the court’s neighbors-to-be, making them not just comfortable with such a seemingly odd and intrusive alteration of their community’s landscape but fully supportive of it, would be critical to the project’s success. Bogaard and Dishman began meeting with them regularly to keep everyone up to date on the project’s progress through the fall of 1983 and into the spring of 1984. Eventually, the community warmed to the project. By May 31, 1984, the new site had been prepared, and the five structures had been readied for the two successive nighttime journeys by truck that would carry them to their destination. Over the next six months, as the bungalows were restored, the garages and small enclosed backyards were added and new owners began to move in, Gartz Court became a quietly elegant addition to the neighborhood’s fabric. David Yamada, whose family has lived in the area since 1909 and who became one of the renovated court’s six new homeowners, gives much of the credit for that to the architects’ design. Bogaard also credits Polyzoides’s almost daily presence on site, overseeing the quality of the work and insisting that missteps be corrected on the spot. The article “The Bungalow, the Street, and the Court: Traditional Elements of a California Architecture & Urbanism,” can be found at mparchitects.com/articles/bungalows2.html.